5. Read the following four statements (A – D). (A) Both photophosphorylation and oxidative phosphorylation involve uphill transport of protons across the membrane. (B) In dicot stems, a new cambium originates from cells of pericycle at the time of secondary growth. (C) Stamens in flowers of Gloriosa and Petunia are polyandrous. (D) Symbiotic nitrogen fixers occur in free-living state also in soil. (a) thin walls, many intercellular spaces and no chloroplasts. (b) thick walls, no intercellular spaces and large number of chloroplasts. (c) thin walls, no intercellular spaces and several chloroplasts. 8. Which one of the following is essential for photolysis of water? 11. Read the following four statements, (i), (ii), (iii) and (iv) and select the right option having both correct statements. (ii) Only PS I is functional in cyclic photophosphorylation. (iv) Stroma lamellae lack PS II as well as NADP. 23. As compared to a C3 -plant, how many additional molecules of ATP are needed for net production of one molecule of hexose sugar by C4 -plants? 24. Photosynthetic Active Radiation (PAR) has the following range of wavelengths. 28. Which fractions of the visible spectrum of solar radiations are primarily absorbed by carotenoids of the higher plants ? 29. 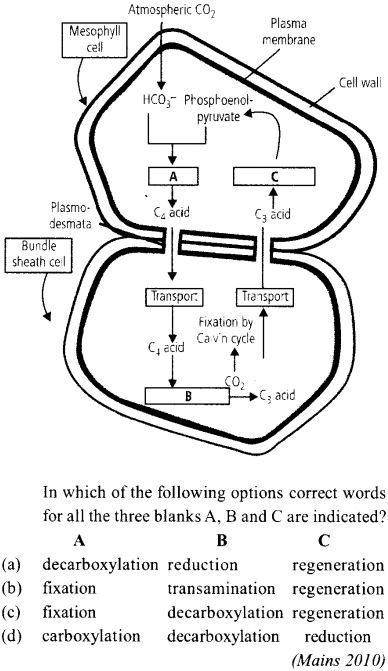 Which one of the following is wrong in relation to photorespiration ? 32. Which element is located at the centre of the porphyrin ring in chlorophyll ? 33. Which one of the following concerns photophosphorylation ? 34. 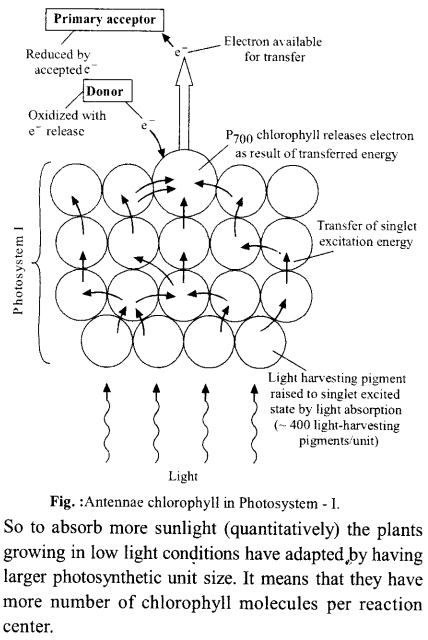 Which of the following absorb light energy for photosynthesis? 36. Which pigment absorbs the red and far-red light? 37. What is true for photolithotrophs? 38. Which pigment system is inactivated in red drop? 50. What will be the number of Calvin cycles to generate one molecule of hexose? 56. Which of the following pigments acts as a reaction-centre during photosynthesis? 57. During light reaction of photosynthesis, which of the following phenomenon is observed during cyclic phosphorylation as well as non-cyclic phosphorylation? 61. Which one is a C4 – plant? 68. Which technique has helped in investigation of Calvin cycle? The light independent reactions (dark or I Blackman’s reactions) of photosynthesis take place in stroma or matrix of chloroplasts. These reactions are enzymatic reactions which catalyse assimilation of CO2 into carbohydrates. Chromatophores are the internal membrane systems of photosynthetic forms which possess photosynthetic pigments. They occur in photoautotrophic bacteria, e.g., purple bacteria and green bacteria. Photorespiration is the light dependent | process of oxygenation of ribulose biphosphate and release of carbon dioxide by the photosynthetic organs of a plant. It occurs in chloroplast. Peroxisome and mitochondria are required for completing the process. This process creates an important difference between C3 and C4 plants as it is absent in C4 plants. Polyandrous condition (having large and indefinite number of stamens) is present in Gloriosa (family liliaceae) and Petunia (family solanaceae). Nitrogen fixation is the conversion of inert atmospheric nitrogen into utilizable compounds of nitrogen like nitrate, ammonia, amino acids, etc. Biological nitrogen fixation is performed by free living and symbiotic bacteria and cyanobacteria. Symbiotic nitrogen fixers occur in association with roots of higher plants. For e.g., Rhizobium is nitrogen fixing bacterial symbiont of papilionaceous roots and Frankia is symbiont in root nodules of several non-leguminous plants like Casuarina. Both Rhizobium and Frankia live free as aerobes in the soil and develop the ability to fix nitrogen only as symbionts when they become anaerobic. Crassulacean acid metabolism (CAM) is photosynthesis by the C4 pathway in which carbon dioxide is taken up during the night, when the plant’s stomata are open, and fixed into malic acid. During the day, when the stomata are closed, carbon dioxide is released from malic acid for use in the Calvin cycle. This is important for plants that live in arid conditions as it enables them to keep their stomata closed during the day to reduce water loss from evaporation. Crassulacean acid metabolism is common in succulent plants of desert regions, including cacti and spurges, and in certain ferns. The C4 plants are adapted to dry tropical regions and have greater productivity of biomass. They have special type of leaf anatomy known as Kranz anatomy. In this type of anatomy the bundle sheath cells form several layers around the vascular bundles; they are characterised by having a large number of chloroplasts, thick walls impervious to gaseous exchange and no intercellular spaces. Manganese (Mn: ) is used for photolysis of water to produce oxygen and electrons during light reaction of photosynthesis. It is the phenomenon of breaking up of water into hydrogen and oxygen in the illuminated chloroplast. It acts as an essential cofactor. Calvin, Benson and their colleagues in California, U.S.A. fed Chlorella and Scenedesmiis with radioactive 14c in carbon dioxide. Radioactive carbon, 14c has a half life of 5568 years. Therefore, the path of C02 fixation can be easily traced with its help. Algal suspensionilluminated and carrying out photo¬synthesis with normal carbon dioxide was supplied 14CO,. The alga was killed at intervals in near boiling methanol. It immediately stopped photosynthesis activity due to denaturation of enzymes. Alcohol was evaporated and after crushing the alga, the product was made into paste. The paste was placed on paper chromatogram and the different compounds were separated by two dimensional chromatography. The radioactive compounds were identified by comparing their position on the chromatogram with standard chemicals. Calvin and co-workers found that after three seconds, radioactivity appeared in phosphoglyceric acid or PGA. Phosphoglyceric acid is, therefore, the first stable product of photosynthesis. Rate of net photosynthesis in C3 plants is 15-35 mg CO2/dm2/hr while in C4 plants it 40-80 mg CO2/dm2/hr. This variation in rate is due to photorespiration. Photorespiration is an inhibitory process which decreases the rate of photosynthesis. In excess of oxygen RUBP carboxylase converts to RuBP oxygenase. As a result glycolate synthesis is enhanced and leads to begin photorespiration. Photorespiration is negligible or absent in C4 plants and present only in C3 plants. So C4 plants are photosynthetically more efficient. Z scheme involves both PSI and PSII to transfer electron excited by light starting from PSII uphill to the acceptor, down to the electron transport chain to PSI, which further comprise of excitation of electrons, transfer to another acceptor and finally down hill to \ADP causing reduction of it to NADPH + H . Stroma lamella contains PSI only. In kranz anatomy the mesophyll is undifferentiated and its cells occur in concentric layers around vascular bundles. Vascular bundles are surrounded by large sized bundle sheath cells which are arranged in a wreath-like maimer in one to several layers. C4 plants, both monocots and dicots, such as sugarcane, maize, sorghum have kranz anatomy in leaf. In cyclic photophosphorylation 2 molecules of ATP are synthesized which are used in dark reaction. Cyclic photophosphorylation is not concerned with photolysis of water. So O, is not evolved & NADPH is also not produced. The dark reactions of photosynthesis is purely enzymatic and slower than the primary photochemical reaction. It takes place in stroma portion of the chloroplast and is independent of light i.e., it can occur either in presence or in absence of light provided that assimilatory power is available. The electrons released during photolysis of water are picked up by P photocentre of photosystem II. The electron extruded by the photocentre of photosystem II picked up by the quencher phaeophytin. From here the electron passes over a series of carriers in a downhill journey losing its energy at every step. The major carriers are plastoquinone (PQ), cytochrome b – f complex and plastocyanin (PC). While passing over cytochrome complex, the electron loses sufficient energy for the creation of proton gradient and synthesis of ATP from ADP and inorganic phosphate. The process is called photophosphorylation (noncyclic). C4 plants are photosynthetically more efficient than C3 plants because C4 plant contain two types of chloroplast i.e., bundle sheath chloroplast and mesophyll chloroplast. So such plants operate a dicarboxylic acid cycle in addition to Calvin cycle. CO, acceptor molecule (PEP) is present in large bundle sheath cell which has higher efficiency in picking up CO2 Thus, photosynthesis continues even at low CO2 concentration and the rate of photorespiration is also negligible. C4 plants show Kranz anatomy i.e. the mesophyll is undifferentiated and its cells occur in concentric layers around vascular bundle, which is surrounded by large sized bundle sheath cells, in a wreath like manner. In this type of plant, the initial fixation of CO2 occur in mesophyll cell. The primary acceptor (phosphoenol pyruvate) combines with CO2 to form oxaloacetic acid which later reduced to malic acid. Malic acid is then translocated to bundle sheath cell for further decarboxylation. Type I photosystems use ferredoxin like iron- sulphur cluster proteins as terminal electron acceptors, while type II photosystems ultimately shuttle electrons to a quinone terminal electron acceptor. One has to note that both reaction centres types are present in chloroplasts of plants and cyanobacteria, working together to form an unique photosynthetic chain able to extract electrons from water, evolving oxygen as a byproduct. Photorespiration is a process the rate of which increases under the influence of light, CO2 is released and O2 is used but no ATP is formed. It involves three organelles chloroplasts, mitochondria and peroxisomes. In chloroplast O, is utilized as, ribulose biphosphate is oxidized and a molecule of phosphoglycolic acid and a molecules of 3-phosphoglyceric acid are formed. This oxidation takes place under the influence of high light intensity. Ribulose diphosphate carboxylase, an enzyme, facilitates this reaction as it behaves as an oxygenase. Only one molecule of oxygen is fixed here. In light reaction of photosynthesis two types of photosystems are involved. PS-I consists of plenty of chlorophyll-a and very less quantity of chlorophyll- h. These pigments absorb light energy and transfer it to the reaction centre – P-700. After absorbing adequate amount of light energy electron gets excited from P-700 molecule and moves to iron-sulphur protein complex, designated as A (Fe-S). It gets reduced after accepting electrons. It later gives these electron to ferredoxin and gets oxidized again. Wavelengths between 400 and 700 nm, which comprise the visible range of electromagnetic spectrum are capable of causing photosynthesis. These are called photosynthetically active radiations. Chlorophyll a and b absorb too much light in the blue and red region of spectrum of light. Carotenoids mostly absorb is the blue region of the spectrum. Photosynthetic rates are enhanced not only by increased irradiance levels but also by higher CO2 concentrations. 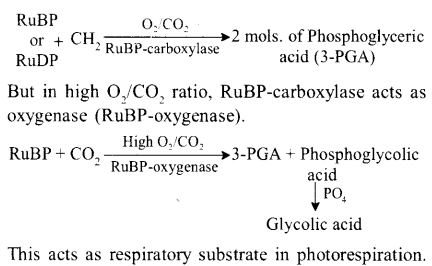 The additional CO2 decreases photorespiration by increasing the ratio of CO2 to O2 reacting with rubisco. Photorespiration decreases with increasing CO2 to O2 ratios, which leads to faster net photosynthesis. At high CO2 concentrations, high irradiance levels increase photosynthesis more than at low CO2 concentrations, and that to saturate photosynthesis a high than at low irradiance levels. In contrast, photosynthesis of C4 species is generally saturated by CO2 levels near 400 ml/1, just above normal atmospheric concentrations, even at high irradiance levels in which demands for CO2 are greatest. Some C4 species are even saturated by normal atmospheric CO2 concentrations. Both plants fix CO2 until the CO2 compensation point of the C3 plant is reached, but the C4 plant will photosynthesize at still lower CO2 concentrations using CO2 lost by respiration. The lower CO2 compensation points in C4 than in C3 species arise from the much lower photorespiratory release of CO2 by C3 plants. A photosynthetic unit is a group of collaborating molecules of pigment, which are essential for a photochemical phase. A quantum of light is absorbed by a single antenna chlorophyll, migrates from one molecule to the other till it reaches the reaction centre. This quantum of light may be used for chemical work that is the generation of assimilatory power, ATP and NADPH. It may dissipate in the form of heat or in the form of fluorescence. The tightly packed chlorophyll molecules in the grana are called antennae chlorophyll (figure). The Calvin cycle is also known as C3 cycle because CO2 reduction is cyclic process and first stable product in this cycle is a 3-C compound (i.e., 3-phosphoglyceric acid or 3-PGA). In this cycle, CO2 acceptor molecule is RuBP or RuDP (i.e., Ribulose 1. 5-biphosphate or Ribulose 1, 5-diphosphate). There occurs covalent bonding of CO2 to RuBP and the enzyme catalyzing this reaction is RuBP-carboxylase/oxygenase (RuBisCO). Carotenoids of higher plants are fat soluble compound that includes carotenes and xanthophylls. Most of them absorb light of voilet and blue range. Green light is absorbed in less amounts. Photorespiration is a type of respiration which occurs in green cells in presence of light. It involves three organelles – chloroplast, peroxisomes and mitochondria. Respiratory substrate in photorespiration is a 2-carbon compound glycolic acid (2C), hence called C2 cycle. RuBP-carboxylase in normal O2 / CO2 cone, acts as ‘carboxylase’. It is the key enzyme of photosynthesis in C3 plants. C4 pathway was first reported in members of family Gramineae (grasses) like sugarcane, maize, sorghum, etc. PEPCo (PEP carboxylase) is the key enzyme used to fix CO2 in C4 plants. Oxaloacetic acid is a 4-C compound and is the first stable product so this pathway is known as C4 cycle. Stomata of most plants open at sunrise and close in darkness to allow the entry of CO2 needed for photosynthesis during the daytime. Certain succulents that are native to hot, dry conditions (e.g., cacti. Kulanchoe, and Bryophyllurn) act in an opposite manner. They open their stomata at night, fix carbon dioxide into organic acids in the dark, and close their stomata during the day. This is an appropriate way to absorb CO2 through open stomata at night, when transpiration stress is low, and conserve water during the heat of the day. These plants show Crassulacean Acid Metabolism (CAM). Chlorophyll is the green pigment present in plants and some photosynthetic bacteria. The empirical formula of chlorophyll-a molecule is C55H72O5N4 Mg It consist of a porphyrin head and a phytol tail. Porphyrin is a cyclic tetrapyrrole structure, having a magnesium atom in the centre. Tail is consisted of phytol alcohol and it is attached with one of the pyrrole rings. The chlorophyll-6 has empirical formula of C55H70O6N4Mg . It’s molecular structure is comparable with chlorophyll-a. Cyclic photophosphorylation – It involves only PS-I, water is not utilized and so no oxygen is evolved. Here two ATP molecules are produced. Non-cyclic photophosphorylation – It involves both PS-I and PS-II, water is utilized and so oxygen is evolved. Here one ATP molecule and one NADPH, molecule are produced. Photosynthesis occurs in chloroplasts that contain photosynthetic pigments – chlorophylls, carotenoids etc. The light energy required for photosynthesis comes from sunlight. The sunlight travels in the form of small particles called photons. Each photon has a quantum of energy. This quantum of energy is absorbed by a single antenna chlorophyll and then migrates from one molecule to the other till it reaches the reaction center. The reaction center is P 700 chlorophyll that releases electron as a result of transferred energy. This electron istransferred between various acceptors and generates ATP and NADPH2 in the light reaction of photosynthesis. Photosynthesis consists of light dependent phase and light independent phase or dark reaction. In light dependent phase occurs in grana fraction of chloroplast. It involves cyclic and non-cyclic photophosphorylation where assimilatory powers (ATP and NADPH2) are produced. In dark reaction, which occurs in stroma froction of chloroplast, actual reduction of CO2 to carbohydrates takes place using the assimilatory powers (ATP and NADPH,) produced in the light dependent phase. It needs 18 ATP and 12 NADPH, molecules to produce one molecule of glucose. Phytochrome has a light absorbing or light detecting portion (the chromophore) attached to small protein of about 1,24000 daltons. Phytochrome occurs in 2 forms, i.e., PR and PFR (i.e., red light and far red light absorbing forms) and these 2 forms are interconvertible. Cytochromes are electron transferring proteins. They contain iron porphyrin or copper porphyrin as prosthetic groups. Chlorophyll is the fundamental green pigment of photosynthesis. It is localized on the chloroplasts. Carotenoids are lipid compounds and they are yellow, orange, purple etc. in colour. These are found in higher plants red algae, green algae, fungi and photosynthetic bacteria. Photolithotrophs are those plants that obtain energy from radiation and hydrogen from inorganic compounds. Emerson and Lewis worked on Chlorella and Calculated the quantum yield for different wavelengths. Emerson observed that rate of photosynthesis declines in the red region of the spectrum. This decline in photosynthesis is called “Red drop”. It was observed that the quantum yield falls when the light of wavelengths more than 680 or 690 nm are supplied. As the PS-II (P-680) is driven by red light, so it remains inactive during red drop. Photosynthesis is actually oxidation reduction process in which water is oxidised and CO2 is reduced to carbohydrates. 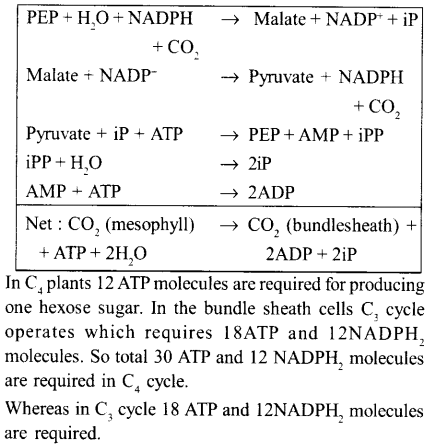 The reduction of CO2 to carbohydrates needs assimilatory powers, i.e., ATP and NADPH,. (i) Light dependent phase or photochemical reaction. (ii) Light independent phase or dark reaction. In Calvin cycle, CO2 acceptor molecule is RuBP or RuDP. The enzyme catalyzing this reaction is RuBP- carboxylase/oxygenase (RuBisCO). As Calvin cycle takes in only one carbon (as CO2) at a time, so it takes six turns of the cycle to produce a net gain of six carbons (i.e., hexose or glucose). In this cycle, for formation of one mole of hexose sugar (Glucose), 18 ATP and 12 NADPH, are used. For 6 molecules of CO2 it needs 18 ATP and 12 NADPH, molecules so for one molecule of CO2 it needs 3 ATP and 2 NADPH, molecules. (ii) Light independent these or dark reaction. (ATP and NADPH,) are mainly produced in this light reaction. The grana of chloroplasts contains many collaborating molecules of pigment. A quantum of light is absorbed by a single antenna chlorophyll, then it migrates from one molecule to the other till it reaches the reaction center. This quantum of light is used for generating ATP and NADPH. An enzyme ribulose biphosphate carboxylase catalyses the dark reaction, pertaining to the addition of CO2 to ribulose-1-5-diphosphate. It is found in abundance in leaves and it is believed that it is the single most abundant protein on earth. It is clear that the first acceptor of CO2 is Ribulose 1-5 diphosphate. The first product formed after fixation of CO2 is 3-phosphoglyceric acid. Plants can use a small portion of light which falls upon them. Chlorophyll-u and chlorophyll-6 absorb too much light in the blue and red region. Carotenoids absorb light mostly in the blue region of spectrum of light. In monochromatic lights, maximum photosynthesis occurs in red light, followed by blue light and poor photosynthesis in green light. Under very high light intensity solarization phenomenon occurs. It involves photo-oxidation of different cellular components including chlorophyll. The empirical formula of chlorophyll a molecule is C55H7,O5N4Mg. It has tadpole like configuration. It is consisted of a porphyrin head and a phytol tail. Porphyrin is a cyclic tetrapyrol structure, having a magnesium atom in the centre. Chlorophyll a a methyl group (CH3) is attached to the third carbon in the porphyrin head. Non-cyclic photophosphorylation involves both PS-I and PS-II. Here electrons are not cycled back and are used in the reduction of NADP to NADPH,. Here water is utilized and O2 evolution occurs. One molecule of ATP is produced between plastoquinone and cytochrome f. Whereas in cyclic photophosphorylation only PS-I is involved. Here electrons from P-700 are recycled back to P-700. Water is not utilized here and O2 evolution does not occur. It involves production of two ATP molecules, no NADPH, is produced. Thus ATP synthesis occurs in both PS-I and PS-II. Blackman (1905) gave the law of limiting factors which states that when a process is conditioned as to its rapidity by a number of separate factors, the rate of the process is limited by the pace of the slowest process. It is the factor which is present in minimum amount. The C4 plants have a characteristic leaf anatomy called kranz anatomy. Here two types of chloroplasts are present – bundle sheath chloroplasts and mesophyll chloroplasts. In C4 plants, there are two carboxylation reactions which occur first in mesophyll chloroplasts and then in bundle sheath chloroplasts. CO2 acceptor molecule in mesophyll chloroplasts is PEP (Phospho-enol pyruvate) and not Ribulose 1, 5-biphosphate. Further it has enzyme PEP-carboxylase. RUBP-carboxylase is absent in mesophyll chloroplasts but is present in bundle sheath chloroplasts. The first product formed is oxaloacetic acid and this is because it is known as C4 cycle. Bundle sheath cells fix CO2 through C, cycle. During photosynthesis a portion of light energy absorbed by chlorophyll and carotenoids is eventually stored as chemical energy via the formation of chemical bonds. This conversion of energy from one form to another is a complex process that depends on cooperation between many pigment molecules and a group of electron transfer proteins. The majority of pigments serve as an antenna complex, collecting light and transfusing energy to the reaction center complex. There are two photochemical complexes, known as photosystem I and II. PS-II absorbs far red light of wavelengths greater than 680 nm and PS-I absorbs red light of wavelengths greater than 700 nm. Both those complexes are on involved in light reactions of photosynthesis. Water molecule breaks up into hydrogen and oxygen in the illuminated chloroplasts is called photolysis of water. A photosynthesising plant is releasing 180 more than the normal. The plant must have been supplied with H2O with 18O. Maximum solar energy is trapped by growing algae in tanks. The light spectrum of red and blue light are most effective in performing photosynthesis for growing algae. In Calvin cycle, CO2 is accepted by Ribulose -1,5- diphosphate (RuDP) already present in the cells and a 6-carbon addition compound is formed which is unstable. It soon gets converted into 2 molecules of 3-phosphoglyceric acid due to hydrolysis and dismutation. Phosphoenol pyruvate (PEP) and Phosphoglyceric acid (PGA) are formed in glycolysis. For a long time, Calvin cycle (C3 cycle) was considered to be the only photosynthetic pathway for reduction of CO2 into carbohydrates. M.D. Hatch and Slack (1966) reported that a 4-C compound oxaloacetic acid (OAA) is the first stable product in CO2 reduction process. This led to an alternative pathway of CO2 fixation which is known as Hatch and Slack’s cycle or C4 cycle. It occurs in sugarcane, maize etc. These C4 plants have a characteristic leaf anatomy called Kranz anatomy. Chlorophyll-a occur in all photosynthesizing plants except bacteria. Chlorophyll-a is the only one common to all organisms that possess chlorophyll (the only one in blue green algae) and is believed to be specifically required. In a few photosynthetic bacteria other kinds of chlorophyll, bacteriochlorophylls, occur. Photosystem II has almost equal number of chlorophyll a and chlorophyll b molecules. It is dark green in colour and located mostly in the appressed parts of grana thylakoids towards the inner surface of membranes. The primary acceptor of CO2 is a 3 carbon compound phosphoenol pyruvic acid. Addition of CO2 to any compound is called carboxylation. In C4 cycle, CO2 combines with phosphoenol pyruvic acid to form oxaloacetic acid. The enzyme is phosphoenol pyruvate carboxylase (PEPCo). The oxaloacetic acid breaks up into pyruvic acid and CO2 which combines with RUDP to form PGA as in Calvin cycle. In photosystem-I, the ejected electron is trapped by FRS (ferrodoxin reducing substance) which is an unknown oxidation – reduction system. The electron is now transferred to a non-heme iron protein called ferrodoxin (Fd) from which electron is transferred to NADP+ intermediate protein electron carrier ferrodoxin-NADP reductase. So that NADP is reduced to NADPH + H+. Rate of yield is dependent of light as photosynthesis is dependent on light. Maximum rate of photosynthesis occur when light is brightest. But during monsoon, the light is dim and so this reduces rate of photosynthesis and hence yield. By employing C14 labelled carbondioxide 14CO2 in photosynthesis and observing the appearance of characteristics radiations in different reactions intermediates and product in different experiments. Calvin and his co-workers were able to formulate the complete metabolic path of carbon assimilation in the form of cycle which is called as Calvin cycle. The dark reactions of photosynthesis is purely enzymatic and slower than the primary photochemical reaction. It takes place in stroma portion of the chloroplast and is independent of light i.e., it can occur either in presence or in absence of light provided that assimilatory power available. Photosynthetic pigments are found in the thylakoids membrane of chloroplasts. The grana lamellae are paired to form sac like structures and form thylakoids. Chlorophylls and other photosynthetic pigments are confined to grana. A very efficient converter of solar energy with net productivity of 2-4 kg/m2 or more is sugarcane, maize which are C4 plants others are C3 plants. The C4 plants have a characteristic leaf anatomy called kranz anatomy. Here two types of chloroplasts are present – bundle sheath chloroplasts and mesophyll chloroplasts. In C4 plants, there are two carboxylation reactions w’hich occur first in mesophyll chloroplasts and then in bundle sheath chloroplasts. CO2 acceptor molecule in mesophyll chloroplasts is PEP (Phospho-enol pyruvate) and not Ribulose 1, 5-biphosphate. Further it has enzyme PEP-carboxylase. RUBP-carboxylase is absent in mesophyll chloroplasts but is present in bundle sheath chloroplasts. The first product formed is oxaloacetic acid and this is because it is known as C4 cycle. Bundle sheath cells fix CO2 through C, cycle. Chlorophyll are the magnesium porphyrin (head, 15 x 15 A) compounds. The porphyrin ring consists of four pyrrole rings joined together by CH bridges. A long chain of C atoms called as phytol (tail; 20 A) chain is attached to porphyrin ring. The dark reactions or Blackman’s reactions or biosynthetic phase involves three steps: (i) Fixation of CO2, (ii) Reduction of CO2 and (iii) Synthesis of other compound from glucose. It is independent of light. Pigment System I is relatively very weakly fluorescent while pigment system II is strongly fluorescent. Light energy absorbed by pigment in the two systems is ultimately trapped by the P700 and P680. Light reaction is associated with the grana of the chloroplasts. It takes place in the presence of light only.